From Apparel to Zoos, Artisan works with many different industries including: Home Furnishings, Needle Crafts, Sporting Equipment, Beads, Candy, Tattoo, Video, Art Galleries, Fair Trade, Craft, CO-OP, and more. Artisan works with many different industries beyond the ones mentioned. The great thing about Artisan working with so many specialty industries is that many of these unique features translate well to other industries. For example we added the Customer Loyalty Clubs for the scrapbook industry. Now any retailer that tracks their customers, can use this feature. Since Artisan fits well with so many industries, it is very likely that we will work well with yours. Learn more about it below or call us to see how Artisan can work for your specific requirements. Artisan can actually help you increase your sales by helping you know more about what goes on in your store. This can help you by keeping you from running out of one of your best selling items and by knowing what your customers like by measuring how fast different products sell. Your customers will appreciate that you are organized and that you know more about them. You can build stronger customer relationship and entice customers back to your store with loyalty programs, events, and mailings. Capture customer information by swiping or scanning a driver’s license (in most states). Marketing to current customers to increase loyalty and repeat purchases is the key to retail success today. Artisan offers a variety of customer loyalty program options. Each transaction is recorded, deducted from inventory and noted on the customer account.This allows you to track sales by product and by customer. You can track customers trends by product, sales by day and by hour and plan staff shifts with Sales By Hour report. 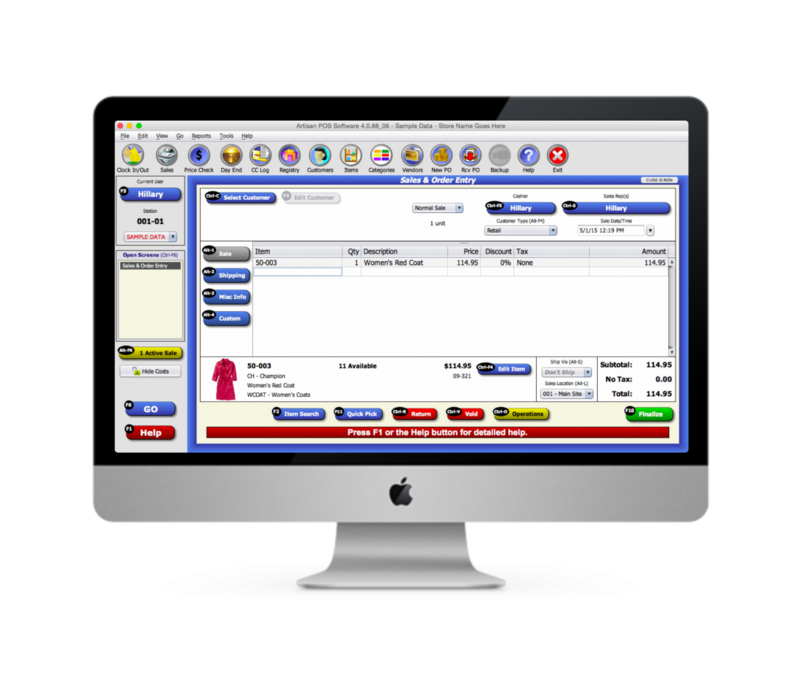 Easily identify your best & worst selling items, set automatic reorder levels for stock items, and discontinue slow sellers. Artisan can print small unobtrusive price tags—with or w/o bar codes—with removable adhesive to protect valuable artwork. You can also get just about any size label you desire with your logo, special fonts, custom layouts and more. We even have “string tag” & barbell jewelry tags. Some customizations are done as a service for a small fee. Supports electronic cash drawers, bar code readers, and many other POS devices. We support multiple terminals, simultaneous sales per terminal, and a full Multi-Store option. Don’t have POS hardware yet? We offer a full range of equipment & supplies. Use your standalone terminals or upgrade to Integrated Credit Card Processing for quicker transactions and fewer errors. Fully compliant with the latest PA-DSS credit card security standards. We pride ourselves on service after the sale. Artisan is easy to use but we’re always there to answer a question or solve a problem.